CL4-E Motor Controller - Nanotec Electronic U.S., Inc. The new CL4-E motor controller from Nanotec is characterized by high performance and its compact design. 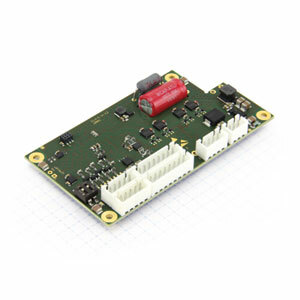 It is suitable for both brushless DC motors and stepper motors and has a peak power of 1050 W. The rated current of this controller is 6 A, additional heat sinks are not required. The motion controller can be controlled via CANopen and Modbus RTU or programmed for stand-alone operation and be controlled via digital and analog inputs. The CL4-E is designed for field-oriented control by encoder, Hall sensors, or sensorless. Due to speed and acceleration feed-forward control, it offers significant improvements over PI controllers in terms of reference behavior and dynamics. Additional safety for the tolerances of 48 V battery packs and power supplies is provided by the 58 V operating voltage. The CL4-E controller is easy to parameterize and program with Nanotec’s free Plug&Drive Studio software.